In response to hundreds of e-mails from my good friends who find themselves portraying Confederates of the far west, I looked into a few jackets to reproduce for our Trans-Mississippi hobbyists. I have settled on producing one from Don Troiani's collection. 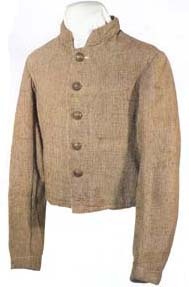 The jacket was originally worn by a Brit serving in Confederacy who took the jacket home with him after the war. He then donated the jacket to the Royal Artillery Museum in 1905 until it was later sent to the United States in the 1990s. I believe this jacket to be a product of mass production. While the depot or contractor may never be known, the jacket exhibits many construction details that lead me to believe that it was more of a product of the ready-made industry produced in large quantities rather than a homespun jacket made by a sewing circle. With the exception of some details like the buttonholes, the entire jacket is sewn by a chain stitch sewing machine. Other construction details like how the pockets were set, how the jacket was hemmed and how the body panels were sewn are all the result of tailors figuring out the best/quickest way to put the jacket together. Time is money in both the 1860s and the 21st Century and I'm sure they were more concerned with making a bomb proof and sturdy jacket in a time efficient manner, than making a work of art. The jacket has a 4 piece body, but it appears to be a 6 piece body as there is a dart under the arm that runs from the hem of the coat to just under the arm. Thi s is typical of many 1840s frock coats I've seen where they began to insert a dart into the side of the coat which eventually evolved by the 1860s into a 6 piece body frock instead of a 4 piece. The reason for the dart rather than cutting a separate panel piece for this particular coat I believe is yet another cost saving measure. All the body panels are sewn, pressed to one side, then machine topstitched for strength. This could have been done to insure the life of the jacket given the unreliability of some chain stitch machines in the 1860s. It must have worked as the jacket is in GREAT shape today. The jacket has a two piece sleeve and the rear seam is topstitched like the body panels, but the front is just pressed open. There is one inside pocket which was set in sort of oddly. The right side was set into the facing, the left into the dart in the lining and the bottom was set into the hem. Another cost saving measure to put in a functional pocket rather than an esthetically pleasing one. There are several challenges in reproducing what would seem to be such a simple jacket to produce. The pattern and actual construction are simple enough and we've already drafted the patterns, but the first challenge is the material. The lining is a heavy, heavy cotton osnaburg which we are having woven this month. The big fabric challenge is the body material. It is a plain woven (tabby weave) with a one over one weave. This means it's not a jean cloth and nothing on the market today resembles this cloth. Both the cotton and wool yarns are very heavy and could account for why the jacket today is in such good condition. We've found a weaver who is willing to take on this custom project. The yarns are being ordered this month and weaving should begin later this winter. Another challenge is the machine itself. We just acquired a period Chain stitch machine and have sent it off to be restored. This may take a few weeks, but when finished it'll replicate the stitch exactly. The final challenge is the buttons. The original had cast Pelican buttons on them, but there doesn't seem to be authentic repro of this button out there and there doesn't seem to be a button maker willing to make a small run of these buttons. I'm still not sure what buttons the jacket will come with. We'll keep working on this dilemma while we await the fabric to arrive. My goal is to start the production later this winter. Of course our newsletter subscribers will be the first to know when the exact launch date is for this product. for permission to use these photographs in this article.